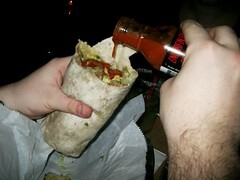 That hand right there is the appendage of Nick Lindauer, the man behind the best hot sauce site around. We met up for dinner so I could review Taco Chulo and he could review a bottle of Endorfin Encounter Hot Sauce. 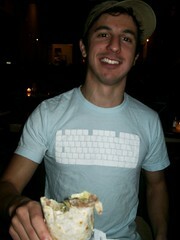 The night before Jonah (Burrito Blog) left NYC, we met up at a burrito joint in Brooklyn that he had received rave reviews about. The burritos at the place were pretty awful, so bad I can’t remember the name of the joint, because I sure as hell won’t be going back there. But the saving grace for the night was the bottle of Endorfin Encounter I had packed with me. Check out his full review of Endorfin Encounter. This Taco Chulo meal was rated: 1.7. For my last burrito in NYC, I walked block after block through the Brooklyn rain to get to Taco Chulo. I ordered a chile verde burrito. It wasn't that great. It sucked, actually. It was nice to have a farewell dinner with the all my roommates. It was just too bad dinner was at Taco Chulo. This Taco Chulo meal was rated: 2.4. When I first arrived in New York City, I emailed a few local food bloggers to ask where the good, cheap Mexican food was hiding. 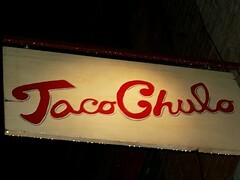 After a few discouraging responses, one foodie directed me towards Taco Chulo in Williamsburg, Brooklyn (Map). Despite what it says on their website, the walk is anything but short from the Bedford Ave. stop on the L train. Also, it's a restaurant, not a burrito shop. I was mislead from the start.